You will face many temptations as a Christian, but you can meet them successfully through God's appointed means his word. The Scriptures caution us to be alert to Satan's subtle attacks. Peter wrote, "Be self-controlled and alert. Your enemy the devil prowls around like a roaring lion looking for someone to devour" (I Peter 5:8). God's word has the power to alert you to Satan's attacks and to enable you to resist temptation. Scripture also has power to guide you in making decisions. God has given his word to lead you in a daily experience of his will. "Your word is a lamp to my feet and a light for my path" (Psalm 119:105). His word also has the power to give you joy. Jeremiah said God's words were "my joy and my heart's delight" (Jeremiah 15:16). And Jesus said, "I have told you this so that my joy may be in you and that your joy may be complete" (John 15:11). As you live more in the light of who God is and what he has said, many tensions and perplexities will start to fade. Although some difficult circumstances will remain, you can trust that God is in control and experience real inner peace and joy. You will recognize more of his purposes in your life. The importance of God's word and the power it imparts to each obedient Christian cannot be overemphasized. The eight passages contained in this pack have been carefully chosen to help you experience the guidance, encouragement, and strength that comes through knowing and obeying God's word. God has given us many privileges. But we also have certain God-given responsibilities. The Bible tells us what God expects of us and how we are to obey him. Our response should be to obey and thank him for all he has done for us. Many promises in the Bible are unconditional. But most of those which concern our growth as Christians are conditional upon our obedience to his will. Going On With Christ highlights eight of these responsibilities which will help you build the foundation for a healthy Christian life. Who will you live your life for? What has first place in your thoughts and plans? Jesus often challenged his disciples to consider their commitment to him and his kingdom. He said, "If anyone would come after me, he must deny himself and take up his cross daily and follow me. For whoever wants to save his life will lose it, but whoever loses his life for me will save it" (Luke 9:23-24). Following him in this way may mean struggles and trials, but it also means the privilege of resting in Christ: "Come to me," Jesus said, "all who are weary and burdened, and I will give you rest. Take my yoke upon you and learn from me, for I am gentle and humble in heart, and you will find rest for your soul. For my yoke is easy and my burden is light" (Matthew 11:28-30). As you memorize and apply Matthew 6:33, seek to know Christ better every day. As you put him, his will, and his work first in your daily life, you will begin to fully experience God's love and care, for he has promised to provide all of your daily needs. Occasionally you may experience failure and discouragement. But the Scriptures remind us of the Christian's true source of strength: God says, "My grace is sufficient for you, for my power is made perfect in weakness" (2 Corinthians 12:9). Centuries ago God told his people, "Do not fear, for I am with you; do not be dismayed, for I am your God, I will strengthen you and help you; I will uphold you with my righteous right hand" (Isaiah 41:10). This promise is just as sure for us today. As you memorize Philippians 4:13, boldly claim the Lord's strength for every challenge and opportunity in your daily life. "How can a young man keep his way pure? By living according to your word .... I have hidden your word in my heart that I might not sin against you." By having the Scriptures in our heart we can experience victory over sin, and can please God in all areas of life. As the apostle Paul said farewell to believers from Ephesus, he committed them to God's care and reminded them that God's word "can build you up and give you an inheritance among all those who are sanctified" (Acts 20:32). The Scriptures give us food for spiritual maturity, and prepare us for our eternity with God. Not having a regular intake of Scripture will stunt our spiritual growth as surely as improper nourishment harms a child. "Like newborn babies," the apostle Peter wrote, "crave pure spiritual milk, so that by it you may grow up in your salvation" (I Peter 2:2). As you memorize Psalm 119:9,11, meditate on the ways God's word can build you up, and look for evidence in your life of how he is doing this.  A new commandment I give you: Love one another. As I have loved you, so you must love one another. All men will know that you are my disciples if you love one another." What is love? John said, "This is love: not that we loved God, but that he loved us and sent his Son as an atoning sacrifice for our sins" (I John 4:10). God is the source of love, and also the perfect example of what love is. God is love. His love is sacrificial. Christ's death is an eternal reminder of this. God's love is also unconditional. You never have to worry about it diminishing. It is not dependent on our worthiness to receive it, for no one deserves God's love-and yet he loves everyone. "Dear friends," John wrote, "since God so loved us, we also ought to love one another" (I John 4:11). As you memorize John 13:34-35, think of some ways you can show God's love to others. God has inexhaustible riches available for his children. We are heirs to all he possesses, for "if we are children, then we are heirs-heirs of God and co-heirs with Christ" (Romans 8:17). God is eager to share these riches with us: "He who did not spare his own Son, but gave him up for us all - how will he not also, along with him, graciously give us all things?" (Romans 8:32). Everything we have is from God. You can show your gratitude to God by generously giving yourself - your time, your possessions, your talents, and your money-to those who have needs. Giving is learning how to share what God has given to us. We cannot give more than God will give back to us. Jesus said, "Give, and it will be given to you. A good measure, pressed down, shaken together and running over, will be poured into your lap. For with the measure you use, it will be measured to you" (Luke 6:38). As you memorize 2 Corinthians 9:7, think of specific and practical ways to share with others what God has freely given you. I rejoiced with those who said to me, 'Let us go to the house of the Lord. '" The Church is made up of all true Christians everywhere-and it includes many thousands of local churches. God instituted these local churches to help Christians grow spiritually. You will have fellowship with other believers there-including opportunities to serve and encourage them. You will receive "training in righteousness" (2 Timothy 3:16) as God's word is preached and taught in the local church. God's word teaches us to seek out this kind of fellowship: "Let us not give up meeting together, as some are in the habit of doing, but let us encourage one another-and all the more as you see the Day appearing" (Hebrews 10:25). Your salvation wasn't earned by your good deeds. We are all saved by faith, and not by good works (Ephesians 2:8-9). Nevertheless, God wants your life now to be filled with good works-doing what is right and helpful to others. In this we are to follow the example of Jesus, who "went around doing good" (Acts 10:38). It is faith alone that saves, but the faith that saves is never alone. Paul wrote that believers should be "careful to devote themselves to doing what is good. These things are excellent and profitable for everyone" (Titus 3:8). As you seek to do God's will through good works, you-and others through you-will profit, and God will be glorified. "Go home to your family and tell them how much the Lord has done for you, and how he has had mercy on you." What could you tell someone about how your life has changed because of Christ? Have you thought about how to give a clear explanation of your faith? Peter wrote, "Always be prepared to give an answer to everyone who asks you to give the reason for the hope that you have" (I Peter 3:15). As someone who has experienced God's saving love, you have much to share. In Mark 5 we read how Jesus encountered a man who was demon-possessed and living in tombs. With power Jesus healed the man. As Jesus was leaving, the man begged him to let him come along. Jesus' reply - found in Mark 5:19 - was that the man should instead return home and share his newfound life with others. The man did so, and we read in Mark 5:20 that "all the people were amazed." We too were living in the "tombs" of deadly sin before we accepted Christ as our Savior. And so, we also have good news to tell others! After you have memorized these verses and learned to apply them, you will be aware of the strength and blessing that come from hiding God's word in your heart. You can continue a systematic Scripture memory program with The Navigators' Topical Memory System. This Scripture memory course covers topics vital to Christian living. 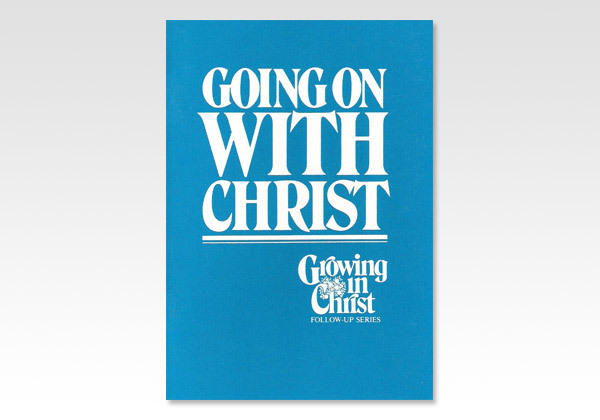 It can be purchased in four versions (KJV, RSV, NASB, NIV) at Christian bookstores.